A smoothly functioning healthcare system is a fundamental building block for a sustainable society. Through the world, healthcare schemes are under pressure, either because they can’t assure proper medical care or because the related costs are exploding. The «access to medicine» debate focuses on broadening the range of treatments even for rare diseases. For its part, the food industry is being called upon to provide healthy nourishment and promote wellbeing. Access to medicine in the developing world is improving, which results in higher life expectancy. Pharmaceutical companies have a direct influence on the speed of this development through pricing and patent policy. The graph shows the proportion of pharmaceutical products with discounted pricing in the Access to Medicine Index, AMI, (2014). 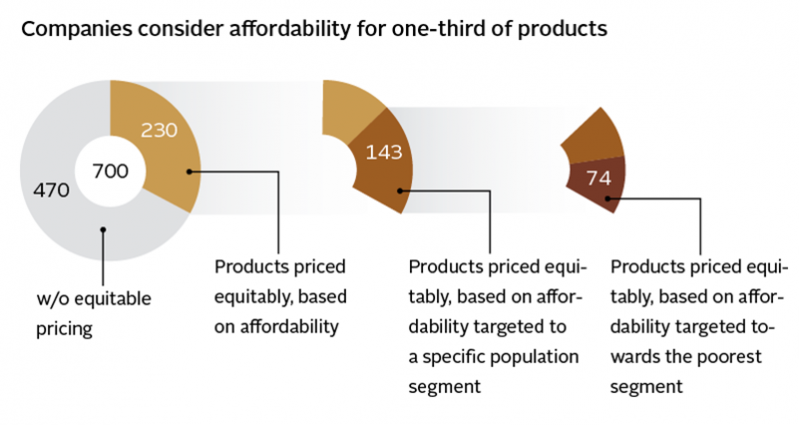 A total of 74 products were found to be priced equitably, based on affordability by the poorest population segments. This corresponds to roughly 11% of the total products analysed by the index. Pharmaceutical companies are making use of practises to improve access to medicine in developing countries. But at 11% the potential for further improvements remains large. It is estimated that one-third of the developing world's people are unable to receive or purchase essential medicines on a regular basis. The populations of industrialized nations profit from the advances made in modern medicine. A popular example is the evolution of child mortality. In Switzerland, for example, child mortality for boys in 1876 was over 22%. By the year 2000 this figure dropped to less than 0.5% and has since remained below that threshold. Meanwhile, the same figure in Angola in 2013 was at 16.7%. Child mortality shows decreasing trends globally, but the speed of the transition differs. Improving access to medicine is one very important factor in speeding up this transition. Whatever their agenda, the efforts undertaken by different producers of pharmaceuticals differ significantly in some cases. Pharmaceutical companies follow an economic agenda along with ethical considerations, when making medicine available to poor population segments. There is a trade-off between making a product available at low cost (and thus low profit) and purely commercial considerations. Growing demand for pharmaceuticals in many countries (led by Brazil, Russia, India and China) is recognized as a major driver for the industry today. Healthier populations are more productive and contribute to economic growth. Companies which make their products available to low-income population segments will profit from brand recognition and trust as developing economies start to grow and can increasingly afford to pay higher prices. Life expectancy of Swiss females has increased by 200% between 1876 and 2013. 137 Billion USD were spent on research by pharma and biotech companies in 2013 according to estimates by EvaluatePharma. 87% of expenditure in R&D on neglected diseases came from the public sector and philanthropy. It is important to note that since 2013, dengue vaccinations are no longer included, leading to a reduced share contributed by pharmaceutical companies. Product safety and consumer health are key issues for any product or service and an integral part of the Globalance Footprint. The need for global, affordable healthcare is a wider concern: The Access to Medicine Index provides important insights on individual companies as well as global developments. We also consider data by the World Health Organization (WHO), World Bank statistics, EvaluatePharma, pharmaceutical companies along with statistics published by government agencies concerning health issues.